What do I do if the baby cries? When your little one cries, your first reaction will be to pick them up or to sit next to them to calm them down. Instinctively you have already done the right thing! By crying your child signals that they do not feel good. If your baby cries, they need the reassurance that you are there and that they are not alone. What should you do if your baby cries? If your child is hungry, picking them up will not keep them happy for very long. If the last meal was more than 2 hours ago, try breastfeeding your baby or feeding them with a bottle. If they only had a proper meal 1 hour ago, hunger is not likely to be the cause for the crying. Instead rather try to pick up your baby, burp them again and wait a while until the next meal. We recommend you do this because if the intervals between meals are too short, the baby’s stomach is still busy with the previous meal and not empty – then your baby will probably cry even more! Flatulence can also be the cause of babies crying. It occurs, for example, if there is still air in the stomach and if the child has not burped sufficiently after the last meal. Therefore, pick up your baby carefully, and burp them once again. Sometimes it also helps to rock the baby gently or to massage their tummy with light, circular, clockwise movements. This will dissolve air bubbles in the intestines the baby cannot get rid off alone. The so-called “airplane hold” can also be helpful with flatulence: lay your baby on his/her stomach on your lower arm. Support your baby’s head with your hand. It is also possible to do it the other way round with the head in your elbow. You can carry your child well like this, or just cuddle. Tip: give your baby a feeling of calm and security in this restless time. Be with your child, hold and rock him/her gently. Make sure of a calm and regulated daily rhythm. regulated daily rhythm. Check whether the diaper is full or if the baby’s bottom is maybe sore. Maybe your baby is crying because they feel cold. Babies are still very sensitive to cold. If you want to warm the bed before bedtime, you can use a special baby hot water bottle with a terry cloth jacket. In this case, make sure the hot water cannot leak and that the bottle is not too hot! When you put your baby to bed, take out the hot water bottle first. Sometimes babies also cry if they feel too hot. 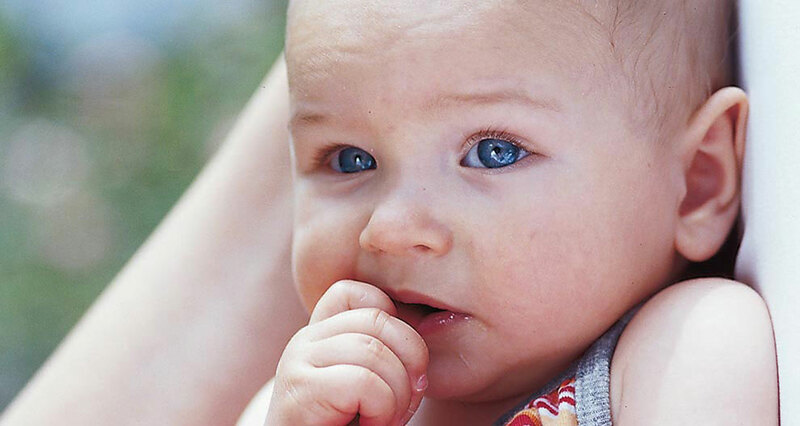 Your baby is sweating around the neck: check with your hand whether they are dressed too warmly. Natural fibres are ideal for clothing because they allow good heat exchange with the environment. The baby will not feel too warm in them, but they will also not be dressed too lightly. Woollen jackets and caps are only required for outdoors and only if it is cold or windy. Tip: if your child cries, sing a lullaby or tell a story. Very often the mere sound of your voice or sensing that you are close will already comfort them.